This test is intended to detect PVS in suspicious plant samples. It causes few or no symptoms and is carried by many cultivated potato varieties and decreases the yield of potato tubers by up to 20%. Infected potato leaves may show slight chlorosis, roughness of the surface and undulation of the margin. 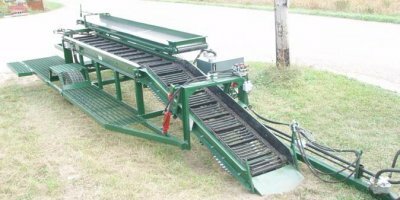 The DOWNS DG potato grader has been designed to receive, clean, grade and inspect different kind of crops. Thanks to a modular construction tested on thousands of machines over the last few decades, the DOWNS potato grader can be totally personalized to be compatible with every agricultural and industrial structures. This test is intended to detect PVA in suspicious potato plant samples. PVA is found in most potato growing areas. The virus may lower yield slightly. In combination with other viruses, it can cause severe diseases (depending on varieties) and yield reduction. Aphids are responsible for virus spread. Automatically Lowers Pallet Box during filling. Reduces handling of product. Increases worker productivity. Electronic controls with manual override. Infinite speed adjustment hydraulic drives. Single or Multi Row available. Spring Action Top Conveyor Belt. Rubber coated belted chain. Tested and Proven Design. The Dewulf R3060, 2-row self-propelled potato harvester, has been proven and tested in potato fields worldwide. In wet or dry conditions, hilly or flat, the offset R3060 harvester has earned its stripes in countless, productive working hours. KaitoSol has been extensively tested in vegetables. Some of the crops that it is being used and tested on are: onions, lettuce, brassicas, herbs, potatoes, spinach, squash, beans, celery and carrots . It has also been tested in various greenhouses crops. For greenhouse results and crops, see Oils & Others. By KaitoSol - Advanced Green Nanotechnologies Sdn Bhd (AGENT) based in UNITED KINGDOM.